MUSIKMESSE 2014: Who'd have thought that a little synth with a name that roughly translates as 'fat spread' and claims to sound "how adult movies sounded thirty years ago" would prove to be the (probable) highlight of our 2014 trip to Frankfurt? 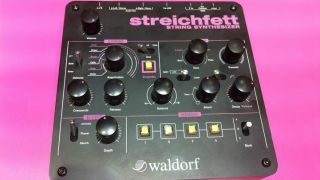 Following its excellent recent Rocket and Pulse 2 desktop synths, German manufacturer Waldorf's latest offering, Streichfett, is a compact string synthesiser with a distinct retro feel to it. In design terms, Streichfett is very similar to Rocket, housed in a module of exactly the same proportions and style, albeit with the green colour scheme of its predecessor switched for a somewhat fitting hot pink. In sound terms, the instrument seems to fit into the classic lineage of synthesisers that sound absolutely nothing like the real life instruments they claim to simulate, but are all the better for it (see also: Roland's TR-808 and TB-303, etc.) There are two sections to its sound engine: a polyphonic Strings section and a mono Solo section. Of these, the former features a two-tier dial that can be turned to morph between sounds including Violin, Viola, Brass, Cello and Choir. There's also a Crescendo (or attack) dial and Release control, plus a switch to add the characteristics of a violin or viola. The Solo section, meanwhile, features a range of sounds including Bass, E-Piano, and Synth, along with Attack and Release/Decay dials and a Tremolo control. There's a central blend control for mixing the two sections, and an effects section offering Reverb, Phaser and Animate settings and a depth control. Upon trying Streichfett it quickly becomes apparent that Waldorf is being somewhat tongue in cheek with the naming of the sounds. What the synth certainly doesn't offer is any sort of realistic emulation of string or brass instruments. Rather the synth summons the vibe of early 'string synths' of the '70s and '80s that often missed the mark of the sounds they were trying to recreate by some margin, yet developed their own distinct character in the process. What Streichfett is capable of, however, is creating thick and warm retro synth tones, with plenty of movement and variation added via the effects and tremolo dial. The ability to morph sounds using the main controls of the two sections, along with the blend control, is fantastic too - we can see the synth being a great tool for summoning washy, evolving pad sounds and the like. It's a bit of a niche concern perhaps, and certainly isn't as flexible as Pulse 2 or Rocket in terms of the range of tones it can create, but it sounds great and seems to have bags of character. With an anticipated street price of under $200, we can see Streichfett adding a little 'fat spread' to plenty of musicians' studios in the months to come.